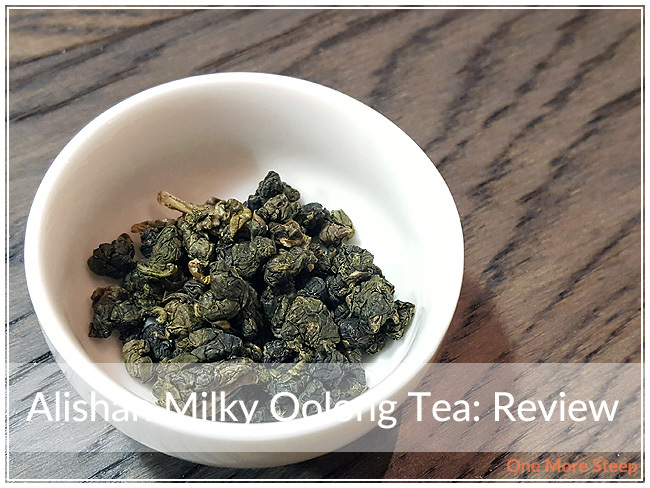 I got this Alishan Milky Oolong Tea from Oollo Tea from the Vancouver Tea Festival in 2016. I can’t remember how much I paid for it, but I can’t imagine that it was greater than $15.00 for the 30g package. It was a limited release, which is why I bought it (and also why I can’t find it on the Oollo Tea website at this time). It got tucked away in my tea stash and I recently came across it again, which is why I haven’t tried it before now (whoops). That said… The tea came in a vacuum sealed gold foil packet that came in a simple manila envelope. The tea itself consists of tightly compressed/rolled tea leaves. The colours are primarily a gradient from an olive to a dark green. The floral aroma from this tea is light and there’s a subtle sweetness behind it. 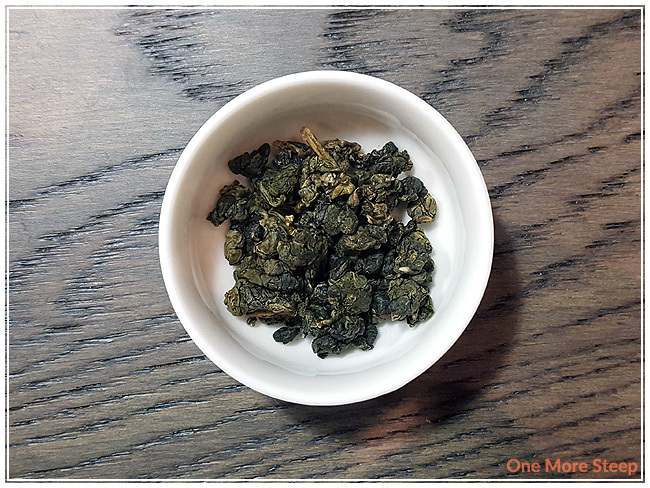 I steeped Alishan Milky Oolong Tea at 85C (185F) for 2 minutes for the initial steep. 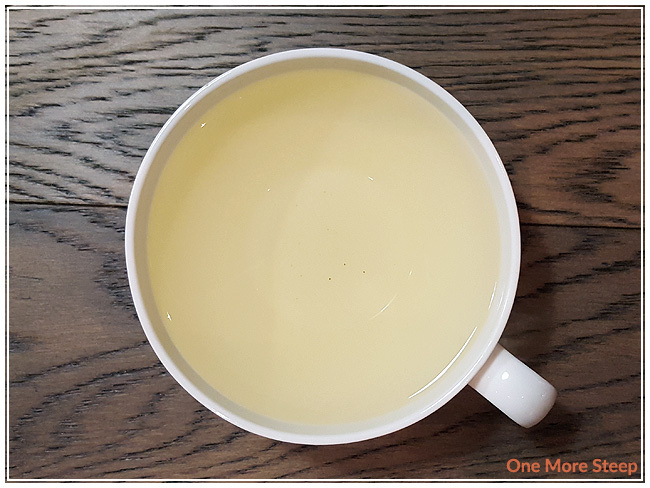 Alishan Milky Oolong Tea steeps to a light yellow after an initial steep of two minutes. I found that the aroma that came up from the tea was floral, but it wasn’t overwhelmingly perfumed – it’s a subtle floral aroma. I found the tea to be smooth – no bitterness, no astringency. I found it to have a creamy texture, with a very light buttery flavour that lingers at the end of each sip. I set aside some of this tea and had it cold and found it to taste a bit sweeter, which was a nice treat. 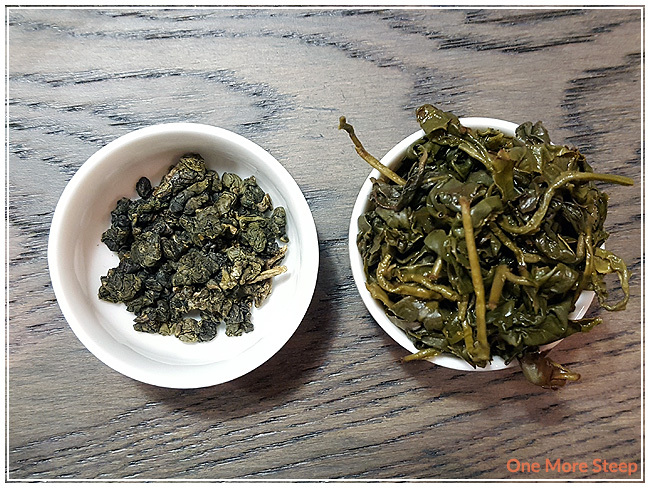 I resteeped Alishan Milky Oolong Tea a total of six resteeps (seven steeps total), and I found the colour deepened as I did more steeps, and began to lighten by resteep #4. The buttery flavours got stronger as the tea became more of a golden yellow, and I found that the floral sweetness stayed pretty much the same throughout all of the steeps. 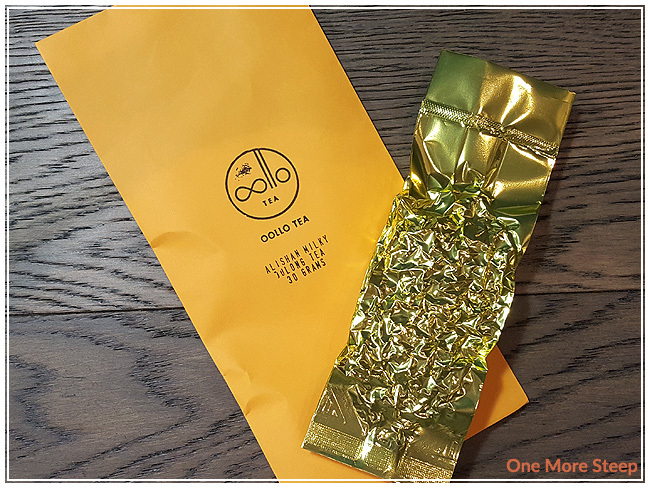 I loved Oollo Tea’s Alishan Milky Oolong Tea. I wish I had remembered it in my tea stash a bit earlier so I could still find more information about it! That said, this oolong meets all my expectations for a milky oolong. I found it to be tasty, and the flavours got better with each steep as the colour became darker. I really enjoyed drinking this, and I think it would be great to have over a lazy rainy weekend afternoon.